Many forms of hydration testing exist, most of which are discussed in this article. Why is Hydration testing important? The practice of hydration testing has been implemented for the past couple of decades, with new and more advanced technology capable of detecting smaller changes in an athlete’s hydration status becoming available in more recent years. Hydration status can influence a range of physiological functions in the human body relating to both performance and health, therefore, regular testing is advised. Many forms of hydration testing exist, most of which are discussed in this article. For any practitioner, it is essential that they fully understand the validity or reliability of the testing method, and how this can be compromised in different situations. Exercise or physical activity takes place in many different environmental conditions, for example, in climates which vary greatly in terms of temperature and humidity. This, in conjunction with a range of other factors, such as fitness level and metabolic rate, can cause an increase in core body temperature and effectively increase perspiration (i.e. sweating) . In humans, the primary method of heat loss is sweating , and this can be substantial during vigorous exercise, especially in warm and humid environments. Sweat not only contains water but also electrolytes which are important for the optimal function of the human body . Loss of these important molecules can not only have a detrimental effect on performance, but also on health , and as such, it is useful to implement protocols capable of detecting these changes in hydration status. Hydration testing can take many forms depending on the available resources and how much time the practitioner is willing to dedicate to it. 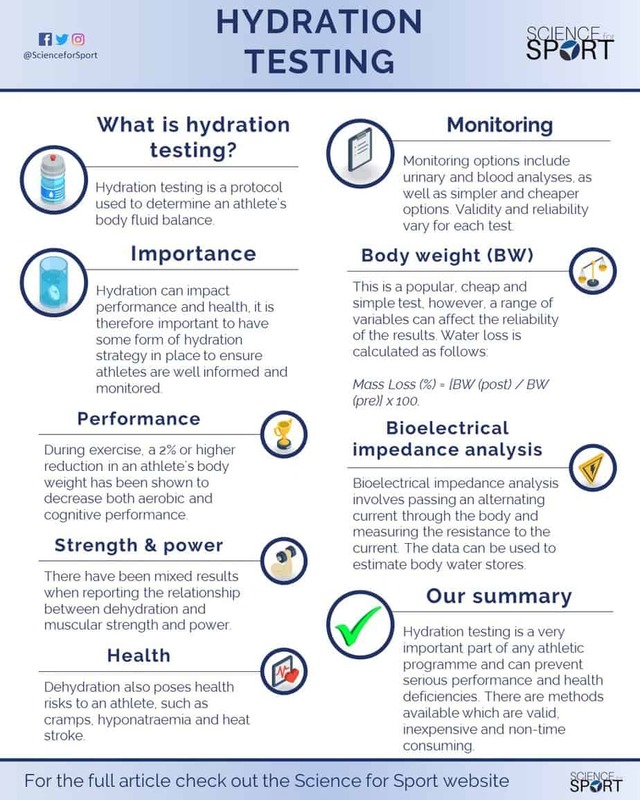 This article will summarise the 3 main methods often used to assess hydration status in athletes, as well as common issues associated with these methods. It is important to note that there is not one particular method which suits everybody in every scenario, instead, the practitioner must carefully consider which method is right for them and their athlete(s). Hydration testing is a protocol used to determine an athlete’s body fluid balance. An athlete with a normal body fluid balance is said to be euhydrated . This euhydrated status is not a specific point, but rather a state of normal body water. Disturbances to an athlete’s body fluid balance can cause severe performance and health defects [3, 4] hence why hydration testing can be a useful component of athletic programmes. When the athlete is in their euhydrated state, they are more likely to be able to perform at their full capacity than if they are dehydrated . Whilst there are numerous methods for assessing the hydration status of athletes, each of them have varying levels of validity, reliability and practicality. It is important to maintain the body’s state of homeostasis as much as possible before, during and after exercise, as this helps to ensure the athlete can perform at their very best and recover adequately. In terms of fluid balance, the goal prior to exercise is to have the body in its euhydrated state . Pre-performance (e.g. training or competition) hydration testing can, therefore, determine if the athlete is in a sufficient state of hydration, and thus ready to participate at their absolute optimum. During exercise, a 2% or higher reduction in an athlete’s body weight has been shown to decrease both aerobic and cognitive performance [8, 9]. There is evidence to suggest that an increase in an athlete’s core temperature can decrease their motor-neural output during exercise. This can have a negative effect on their exercise tolerance time and their drive to exercise in the heat due to serotonergic mechanisms . As mentioned before, dehydration can affect aerobic performance. This is because body water deficits can result in an increase in cardiovascular strain due to an increased heart rate and decreased stroke volume; ultimately resulting in a decrease in cardiac output. Dehydration can also lower cardiac filling due to a reduction in blood volume, this is often accompanied by a rise in skin blood flow and skin compliance . There have been mixed results when reporting the relationship between dehydration and muscular strength and power. Whilst there have been reports that dehydration does affect muscular function [11, 12), there are also contradicting results [13, 14). This suggests that this is an area for future research in order to determine if there is a relationship between dehydration and muscle functioning. The previous section explained how dehydration can affect the central nervous system, effectively causing fatigue. However, there are other health risks that dehydration poses to an athlete, such as cramps, hyponatraemia and heat stroke (this will be covered in the next section). Whilst there is not an overwhelming amount of scientific evidence for either of the three  it seems as though the altered neuromuscular hypothesis has the more likely pathophysiological mechanism for EAMC. Basically, exercise will cause muscle fatigue which will, in turn, increase excitatory afferent activity and decrease inhibitory afferent activity. This leads to altered neuromuscular control which then affects alpha motor neuron activity leading to EAMC. Although it is important to recognise the number of factors that will determine the severity (e.g. exercise intensity, duration, conditioning level) . Prolonged exercise (>5hrs) can cause hyponatraemia, which is defined as having a diluted blood sodium concentration in the body . Hyponatraemia is caused when an individual consumes fluids low in sodium or sodium-free water and does not replace the necessary electrolytes lost . As a result, marathon runners seem to be prone to hyponatraemia when they do not implement effective hydration strategies . There also seems to be a relationship between the severity of the symptoms (e.g. nausea, headache, confusion and fatigue) and the amount by which blood sodium concentration have fallen . As previously touched upon, there can be serious health risks for individuals who exercise whilst dehydrated. In some extreme cases, there have even been several reports of death due to heat stroke, with dehydration said to be a contributing factor . To prevent this from occurring, there are natural neurophysiological processes in place to maintain homeostasis. Thermoregulation is the process in which heat is dissipated from the body in order to maintain an optimal core temperature (37°C) . A rise in just 1° can activate the body’s thermoregulatory centre, which can then act to reduce the body temperature through several mechanisms ; one of which being perspiration (i.e. sweating). It is proposed that dehydration reduces cardiovascular function, which, therefore leads to a decrease in skin blood flow and the inability to lose heat via sweat [8, 21, 22). To summarise, given the impact hydration can have not only upon performance but also on health, this firmly demonstrates the importance of having some form of hydration strategy in place to ensure athletes are well informed and monitored. There are a number of different ways to measure an athlete’s hydration status, each with their own levels of validity, reliability and practicality. Urine Specific Gravity (USG) is the density of a urine sample compared to the density of water . The density of the sample is determined by its osmolality, as well as the concentration of a number of molecules such as urea, protein and glucose. There are 3 main methods of testing an individual’s USG . Hydrometry: The density of the sample can tested using a weighted glass float . This method is considered to be inaccurate and impractical due to a daily calibration being needed, a large urine sample, and also because it is temperature sensitive [6, 23]. Refractometry: This involves a light being passed through the sample and measuring how much the beam has refracted . In contrast to hydrometry, it requires a smaller sample and internally corrects for the temperature; making it a more practical and inexpensive option for measuring hydration. Reagent Strips: These strips offer a more simple approach than refractometry and hydrometry. The strips react to the amount of hydrogen ions released in the sample, which ultimately affects the pH and is detected by the Bromthymol blue contained in the strip . As the pH decreases (indicated an increase in H+ ions), the strip changes colour to a more yellow-green. A colour kit can then be used to estimate the samples USG. Bioelectrical impedance vector analysis (BIVA). This article will mainly focus on SF-BIA because it is of relatively low cost, portability and its practicality. . Whilst it has been criticised for its poor accuracy in subjects that have significantly altered hydration levels (e.g. in clinical settings), it can still be used to estimate total body water (TBW) in subjects that are normally hydrated; such as athletes . The science behind this approach is quite simple: it involves an alternating current passing through the body (50 kHz) and the resistance to the current is measured . There are a number of ways that this can done, such as using gel electrodes that are placed on both wrists and ankles or using a stand-on platform with hand-held devices . The data received depends on the model of equipment used, some devices provide an estimation of total body water stores, whereas others provide raw data and calculations must be used to further predict the athlete’s body composition . Subjects: height and weight need to be correctly calibrated using a stadiometer and scales closest to the nearest 0.5cm and 0.1kg respectively. Body weight changes have been used in the past to measure acute changes in hydration status . This method’s popularity with sporting clubs can be accredited to the fact that it is a simple, non-expensive and non-invasive tool that can provide a quick estimate of an athlete’s so-called hydration status. For example, if an athlete weighed in at 78kg before training and weighed out at 76.8kg after training, the equation would read: [76.8kg / 78kg] x 100 = 98.5%. Meaning a mass loss of 1.5%. From a practical perspective, this method uses minimal equipment, is quick to conduct, cost-effective, and can provide a quick estimation of an athlete’s hydration status immediately after exercise. However, it is important to understand the different variables that can affect the reliability of the results. It is thought that a number of blood-borne indices can be used to test the dehydration status of an athlete. Hypertonic dehydration (e.g. from profuse sweating) can be detected through changes in plasma osmolality and plasma sodium [30, 32), whilst hypotonic or isotonic dehydration can be detected through serial haematocrit or haemoglobin measurements . This method of hydration testing can be costly, invasive and labour intensive . Due to the fact that it requires blood sampling, there will always be a risk of infection, bruising and vein damage. Limitations regarding hydration testing primarily appear to be related to its practicality in the field. For example, it would be impractical to have an entire AFL or Rugby League team use BIA after every training session or to use USG to estimate hydration level. Unfortunately, due to the current technology, to implement a method that is appropriate/practical (e.g. BW changes), measurement accuracy will, most likely, be sacrificed. Coaches, fitness and medical staff must communicate on what they feel is the most appropriate method for their particular sport. A further issue with hydration testing can be the priority that this measurement takes in the eyes of the fitness and medical staff. Coaches outside of an elite environment may not have the time or resources to hydration test their athletes, potentially putting their performance and health at risk. The effects of acute rehydration after exercise as net weight gain is not an acceptable method of rehydration assessment as it fails to monitor fluid replacement in both the extracellular and intracellular compartments of the body . This is where measures of urinary and blood parameters can play a part in determining an individual’s hydration status both before and after exercise. Indices such as potassium, sodium and protein may be appropriate hydration tests , but no methods are currently available which are simple, quick and low-cost. Hydration testing is a very important part of any athletic programme and can prevent serious performance and health deficiencies. There are methods available which are valid, inexpensive and non-time consuming, but the confounding variables that may affect results must be addressed. The method which best suits the practitioner/coach and their environment will depend on a number of factors; such as the resources available and the time-cost. Future research is required for assessing whether urinary and blood indices can be used as hydration tests in a practical sense. 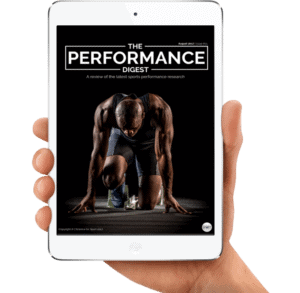 New and improved practices with regards to hydration testing and many other forms of performance testing (e.g. strength and power) are continuously being evolved in order to enhance validity, reliability, and ultimately, training transfer. 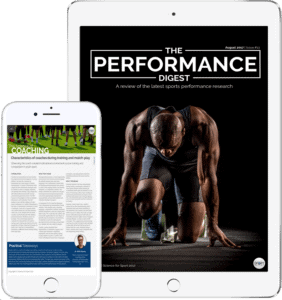 So if you’d like to stay up-to-date with all the latest info and research surrounding performance testing, then subscribe to our monthly Performance Digest. Sports Science entails many, many topics. By choosing to simply read up on Hydration Testing and ignore the sea of other crucial Sports Science topics, you run the risk of being detrimental to your athlete’s success and not realising your full potential. To make you an expert coach and make your life as easy as possible, we highly suggest you now check out this article on Bio-Banding. Institute of Medicine. Washington D.C. Dietary Reference Intakes for Water, Sodium, Chloride, Potassium and Sulfate. National Academy Press. [Book]: 73-185, 2005. Sawka MN and Pandolf KB. Effects of body water loss on physiological function and exercise performance. Perspectives in Exercise Science and Sports Medicine (3):1-38, 1990. Powers, SK and Howley, ET. Exercise Physiology [Textbook], 2014. Taylor, NAS and Groeller, H. Physiological bases of Human Performance during Work and Exercise [Textbook]. 2008. Knochel, JP. Clinical Complications of body fluid and electrolyte balance. Body fluid balance: Exercise and Sport [Textbook], 1997. Mueller FO. Annual survey of football injury research: 1931- 2001. Chapel Hill (NC): National Center for Catastrophic Sports Injuries, 2002. Brunzel, NA. Fundamentals of Urine and Body Fluid Analysis [Textbook], 1994. Strasinger, SK. Urinalysis and Body Fluids [Textbook], 1994. William is a recent graduate from Deakin University with a Bachelor of Exercise and Sport Science. 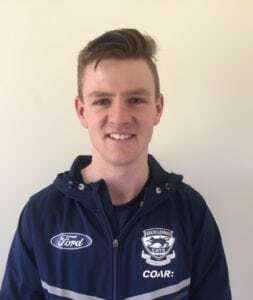 He has just completed a year-long internship with The Geelong Football Club (an elite AFL club) in 2017 where he was exposed to GPS and HR analytics as well as other aspects of high performance. In 2018 he will be completing his Honours project titled “Adaptations to environmental training interventions in AFL players”.